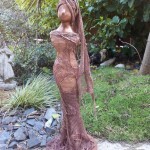 FIGURINE, WALL OR GARDEN ART…… IN JUST A FEW HOURS!! Paverpol is a much sought after fabric hardener that was developed in the Netherlands and is available in many countries including New Zealand. Artists and hobbyists have been using it for the nearly 2 decades and love its versatility and suitability for indoor and outdoor use. 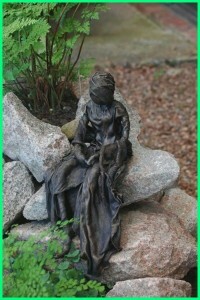 Perfect for statues or figurines, garden art, wall hangings, scrapbooking, or collage. Highly durable with its unique hardening agent that protects your valuable art-work from the harsh elements of our weather. Frost Safe. Extremely safe water based product that is non toxic and therefore completely harmless to people, plants and animals. Very user-friendly medium – while it takes less than a day to be touch dry, it is quick and easy to manipulate giving the artist plenty of time to work with it. Highly economical because unlike other hardening products it does not dry out when kept in a sealed container. So you can use every last drop. 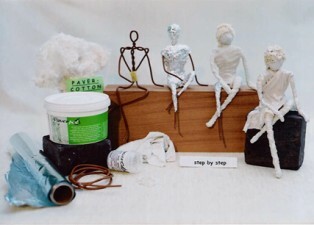 Materials used are readily available such as new or old cotton textiles, wire and tinfoil. Adheres to any porous material such as wood, plaster, ceramic, clay, stone, concrete and polystyrene. PaverColor is a powder colouring agent that is mixed with transparent Paverpol. There are 26 colours to choose from including 6 metallic colours giving the artist a wide choice for base colours and highlights. Other compatible products are available to enhance your works of art. These include Paverplast, Artstone and Paversand. Garden Sculptures made using Paverpol Fabric Hardener in combination with Pavercolor render the fabric weatherproof and therefore suitable for outdoor use. You can build an income stream by becoming an Accredited Workshop Instructor. or go to our Facebook Group .. Paverpol in New Zealand.